Now don’t ask me how I know your gender. Your total inability to listen to what I say is no better than all the other 3 men in the house. So obvious guess – you must be a male! I’m sort of done looking for you. Do you have the faintest of idea, as to how difficult it is to give you all the attention at 6 am in the morning? A woman, who’s probably not got decent sleep all thanks to the mobile era and the ME time. The poor lady struggled to get a decent shut-eye because she couldn’t complete level 3 on candy crush. That’s quite a shame because her 4 years old CAN do that, but anyway. So she doesn’t get good shut-eye, and struggled to say goodbye to her blanket. BUT SHE DID because if she doesn’t wake up and the kids stay home, its a different level of madness. But hey back to the imagining part again – so, no shut-eye, really cranky and tired, and just like every day, she is late again! In the haste to pack those lunch boxes, she ushers everything here and there only to see Mr. Tupperware Lid throw an attention seeking gimmick again. Mr. Tupperware Lid is NOWHERE to be found! Your attention mongering is a trouble to this poor lady but obviously, YOU DON’T CARE! All you care about is your silly hide and seek games and most days, it’s just hide. I really wish you could play these games on weekends, I got fairly better time on weekends … and what, we’ve discussed this a hundred times! Then, out in the Diwali cleaning madness, a couple of you crop up looking like a piece of crap because obviously, you got rotten as you hid in your god-knows-which place. There are spider webs on you and cockroaches lay eggs. The rats nibble on you and you know what? I’d rather discard you than use you again! So, Mr. Tupperware lid, I write to you to tell you that I’m done with you and your attention seeking behavior. I urge you to go freaking see a therapist because you really need help. At least think of your Tupperware box, who tends to feel lonely and ‘useless’ when you are not around, at least think about this poor woman who is anyways having a hard time juggling home, kids, me time, a husband, a job, and everything there is! It will be kind of you if you came to my hands before I see you hugging the maid’s hands. I hate to see her smirk and flaunt you like a trophy of diamonds when she finds you. So this is my last and final request before I replace you and your poor friend the Tupperware box. Please ‘straighten up’ and learn to behave before I replace the whole of you guys with simple Rs 5 plastic boxes. I’m serious, I will do it! So now, you gotta tread your waters carefully, or else, you know my wrath. Looking forward to earnest and honest cooperation from you. If you liked reading this letter, do SHARE it ahead!! The Featured Image is pinnable, so give us some Pinterest Love by pinning my blog on your Pinterest Boards! You may also like to read the previous letter which was a Not-so-emotional Letter to my Twins. If only they could hear us!! aaargh.. i totally feel the pain! haha, absolutely!! but i thought, why not, let’s give it a try! Haha, it is really funny even when you are angry at the lids 😜. Loved the read ❤. 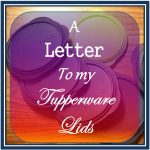 Absolutely loved reading this tupperware lid letter. I have been using Tupperware for years but always struggle with the lids. Such a fun post!! hhahaha…. Same story at my place and that’s the only time I criticize my help & lids but in my thoughts because I can’t afford my help to leave me as she’s my only hope. Hahaha 😂 This is something funny and true at the same time. I loved reading this. I can so much relate to this quirky yet funny letter, hoping that they are listening somewhere to our thoughts! Thoroughly enjoyed reading. Woah! Full points for creativity! And three dishes in the morning?? I would run away ! your post had me in splits. I reminds me of the innumerable times, when I struggle to find the lids to my kids’ tiffin boxes. that totally hilarious but relatable thing. it happens to me too.. Seriously laughable lines… I am wait to know did you ever hear back from Mr.Tupperware and what was his side of the story! When do we know? This is so you, Prisha! I could picture you having this conversation with the lids! A post that brought a smile to my face, just like your Instastories do. Loved it! Very nice, they would now definitely rush back. This is the first of a kind letter I have ever read. It sets me thinking that there are a couple of inanimate objects I want to have a chat with. What fun that would be! Thanks for the share! That was so brilliantly hilarious. Loved the language and sarcasm. Hahaha…this post had me grinning all through out. Different concept of talking to an inanimate thing. A funny read though. I think it’s a very common problem for all of us searching for the lids. Sometimes I even wonder where I’ve kept my spectacles and hope it does have a number so that I can call it and ask its whereabouts. haha.. hilarious! this is my first visit to your blog. But have watched your funny antiques on insta. you have one hell of a talent. Ha ha, had a fun time reading this! And I so agree with you. BTW, I have a different story to write – my Mr. Tupperware lids get broken leaving their poor spouses alone. Urge you to write more frequently, would love to visit your blog more often to read your brilliant posts. That’s hilarious! In fact, I can easily imagine myself in your place. Loved it. Loved it Honey ….this is superb. Thoroughly hilarious! Agree that the tupperware lid is certainly male. Hilarious!!! Thanks for making my day lighter! I had a hearty laugh treading this Prisha. I could imagine you talking to the lids!! Love your sense of humour and the commendable ability to find humour in the most mundane things. You nailed it .. yes, you absolutely have!!!! It was hilarious AF!!!! Love this post with a funny punch and I have been switching to glass containers and try to put the lid always. hahha, this is hilarious. I want to say the same to my gazzilion lids that have been lost in office, or between shelves! This is highly relatable. We can NEVER find those lids. They’re probably wearing invisibility cloaks or something! Haha that was just lovely to read . The heading of your post made me curious . You have put a funny side on moms’ daily troubles in the kitchen , who are in utmost hurry making food in the mornings and also packing the tiffins . Atleast the lids should listen to us . That was hillarious! So relatable. You got me hooked till end. And No!No! They do not care about your wrath because they know their self-importance, we cannot pack lunches without them. The spill-proof freaks they are! I loved it. Its a Unique topic. Wonderful.